Obviously, there are no pumpkin patches in Doha, Qatar; it is much too hot here in the desert. I had been told by a knowledgable source that the large orange pumpkins were at a Farmer's Market for about $5 (there are fruits and vegetables imported from Egypt, Jordan, Iran, and other countries around here). 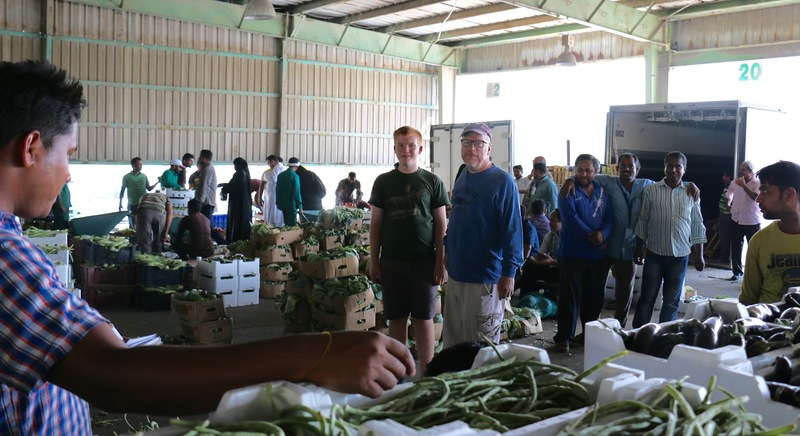 Our little family excitedly trekked over to the Wholesale Market. I was definitely not paying the $50 price tag for the curvaceous, orange ones in the grocery stores here. 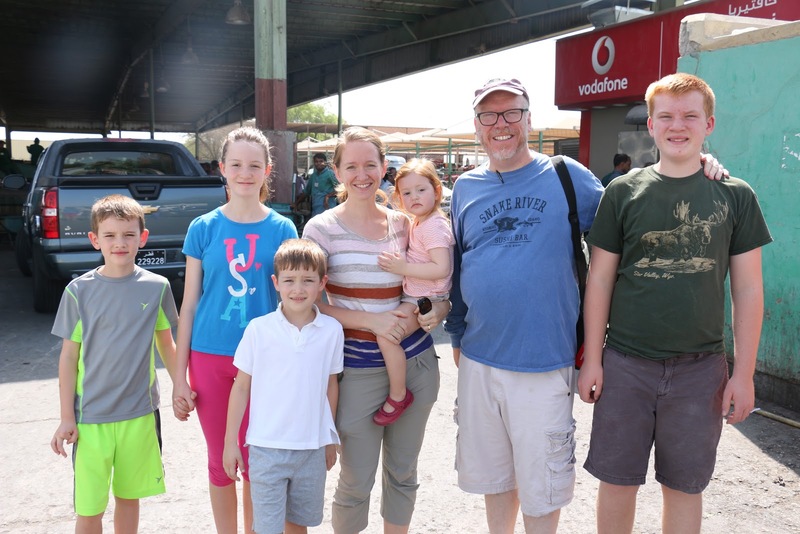 A few of us expats descended at the market--fully expecting to be able to buy some round, cheerful, orange pumpkins--the kind we had always purchased or grown at this time of year. However, it must have only been a small load that came in the week before. There were no orange pumpkins to be found amidst all the venders. I never thought I would pine over pumpkin patches. They were just always there, just part of every autumn season. But this week I learned a valuable lesson from an improbable source: the pumpkin. I decided that I can enjoy being an expat--when things don't work out as anticipated or hoped for. Indeed, there can be substitutions and compensations that can make us laugh and even enjoy the differences. 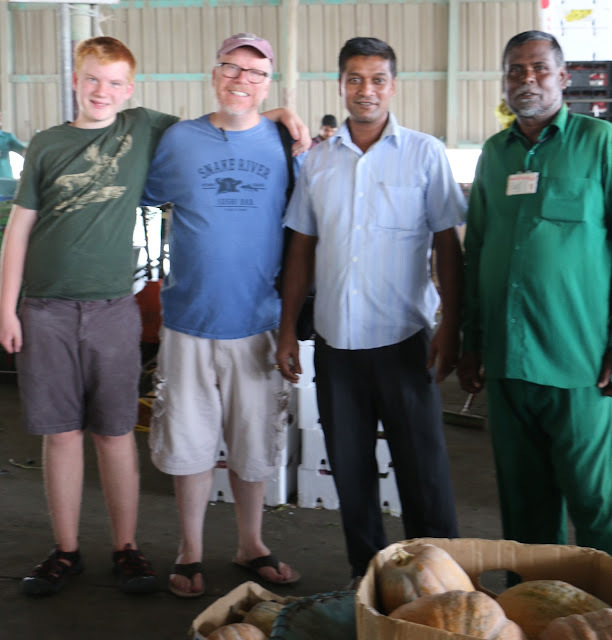 In our excursion to find the "perfect" pumpkin (or the thing that we have traditionally always had), the search can trigger an adventure, an exploration, new friends, and definitely a chuckle. We came home empty handed with what we had searched for, but nevertheless, happy with a new adventure under our belt. No one could understand "pumpkins" when I asked around--lots of puzzled faces. They did understand the word "orange" so I was led to the Egyptian stall where they sell oranges. No matter. I bought a small crate of them--you cannot just buy a few. Every morning we have fresh squeezed orange juice, but alas, no orange pumpkins to be found. On the scout for some "orange" pumpkins. Do you see the men in the background wanting to get their picture taken? Most of the fruit/vegetable dealers are from India, Egypt, and Bangladesh. They love to be in our photos. 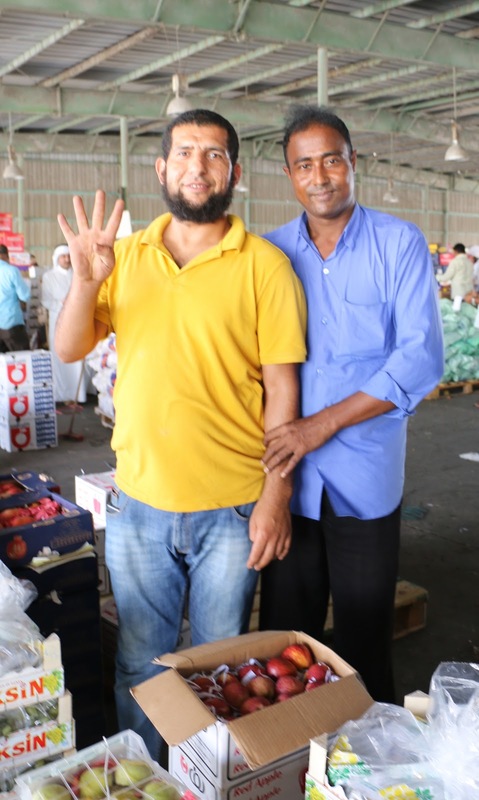 Some happy fruit sellers from Egypt and Bangladesh--wanting me to take their picture. It's funny I can tell which countries they are from now--even their personalities give it away. I have found Egyptians to be very playful, funny, light hearted. I immediately knew which one was Egyptian. They are usually making a joke about something--even when their English is minimal. Another Eyyptian fruit seller that sold me some pomegranates. He made me laugh so of course, I bought a crate of pomegranates. I just gave some to my neighbors. We can never eat a big box of pomegranates. Some friends that we found at the farmer's market, searching for their treasured pumpkins too. 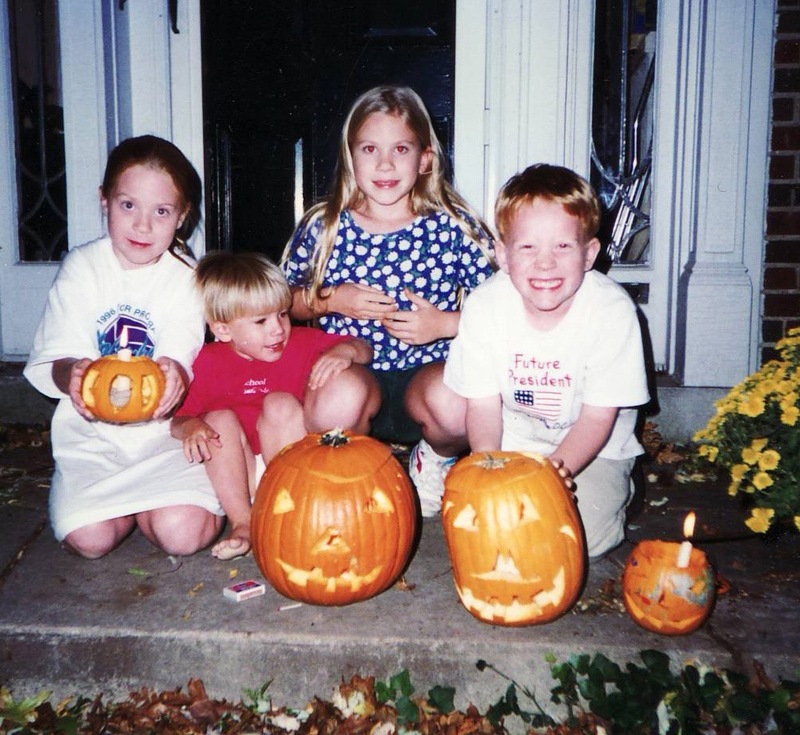 Look at the happy faces, even though it is not the typical pumpkin patch we are accustomed to. 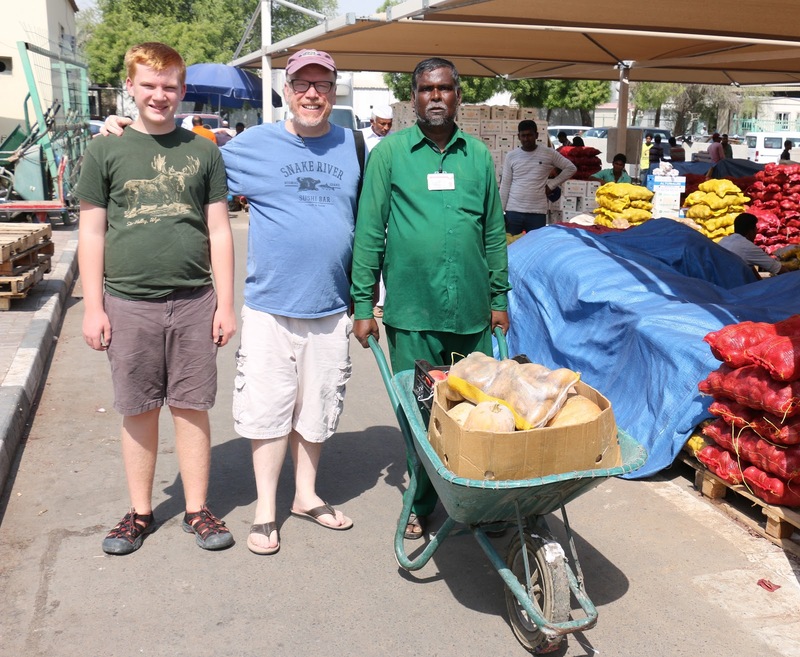 The entire time you are in the Farmer's Market they are unloading huge amounts of vegetables and fruit. 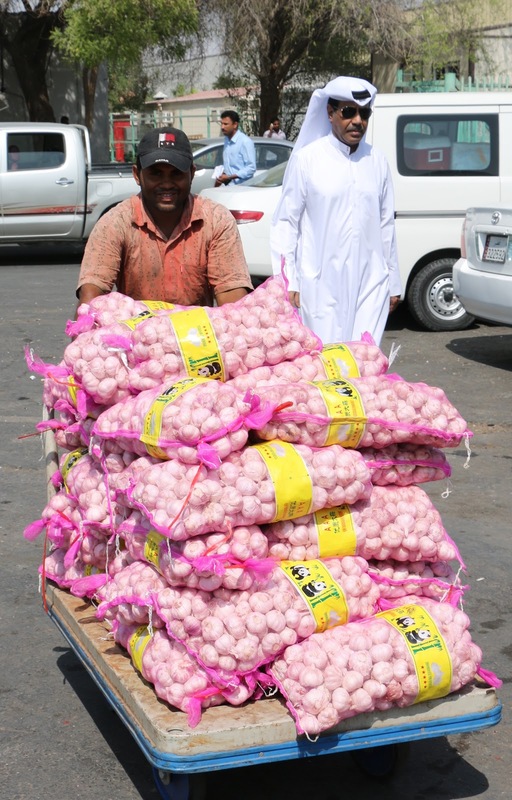 Here is a cart full of garlic. 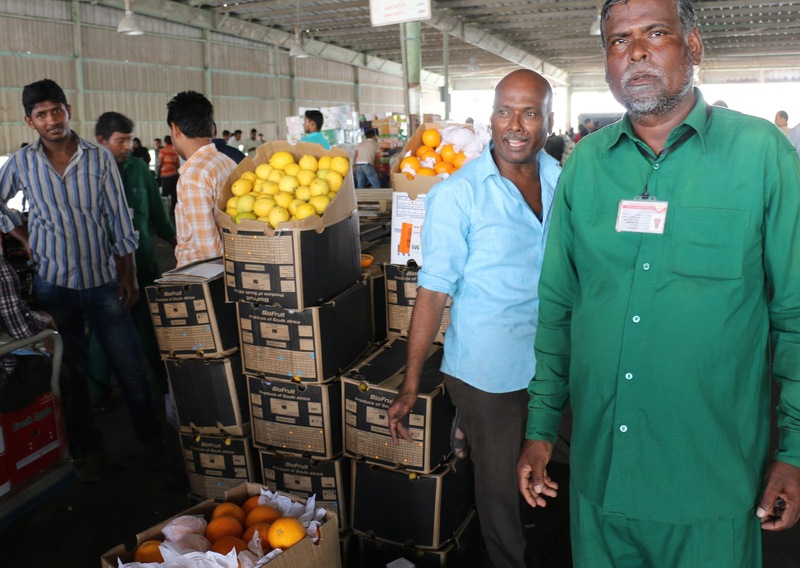 Our Bangladeshi "trolley" driver carting our Iran squash (pumpkins), potatoes, pomegranates, grapes, and "oranges." Not to let the failed attempt to find orange pumpkins dampen our spirits, we just added the trip as one more adventure in Doha. Across the street is a Fish Market. 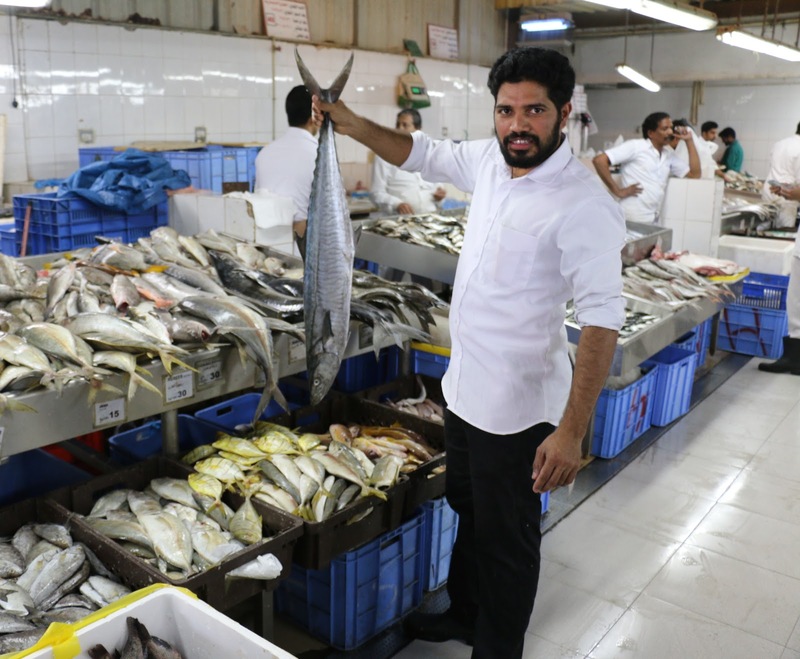 A fisherman showing off his catch. I get this! 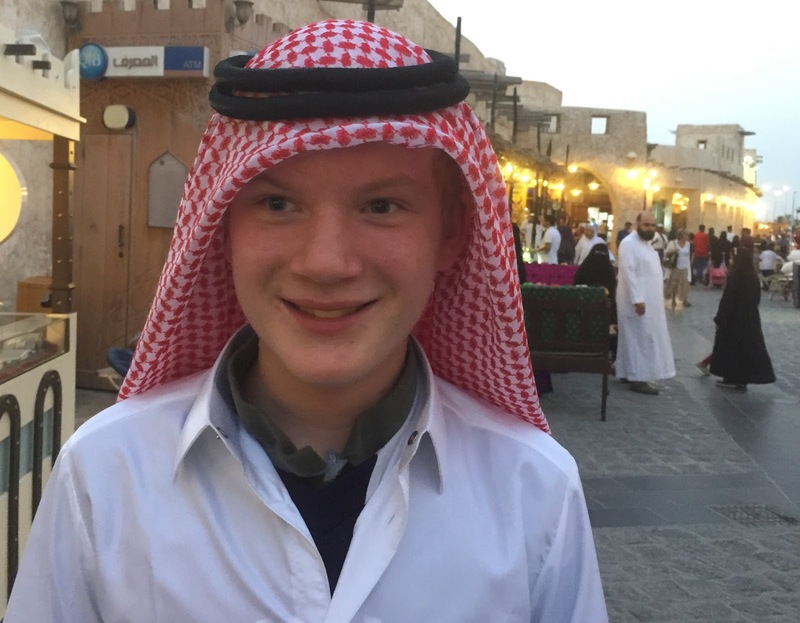 Sometimes the boys like to dress up in the Qatari native dress. I would be lying if I told you I didn't miss the autumn, but to experience new people, traditions, and cultures can be rejuvenating and enlivening too. So I say the "proof is in the pumpkin" that I can be happy in lots of places. Pumpkins can come in many other different, lustrous colors and shapes. Each of the cellists in this section are from a different country. One of the best things about learning the cello have been my teachers. They have been from all over the world: the United States, Bulgaria, Germany, and Russia. 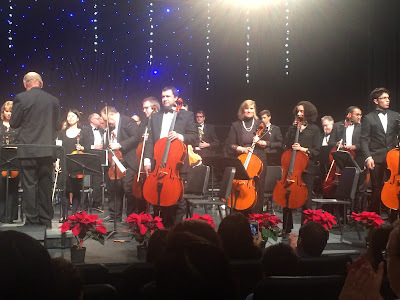 Each of them are uniquely trained, and have not only taught me about the techniques of playing the cello. I have learned other meanings of risk-taking, persistence, focus, exactness, and sheer determination. Today my German teacher said to me in our lesson, "It's not about the tempo. It's about perfection." I had to smile. My cello teacher, Katrin Meingast, here in Qatar, who directs the Baroque Ensemble and German School music program. I think I would have got off the ship long ago if it had not been for my first cello teacher. I remember when I was discouraged, she said some very wise words that resonated with me, and now I try to apply it to my life. I said, "I know I am playing 2nd, 3rd, and 4th positions on the cello (I was already familiar with 1st), and I am doing it. But I can't visualize it. I don't even know the notes I am playing." She turned to me, and said, "You know enough. Just keep playing, and everything will fall into place." I can't tell you now how many times I have said, "You know enough" when I am playing the cello and attempting the unknown in other facets of my life. My first cello teacher, playing some chamber music. 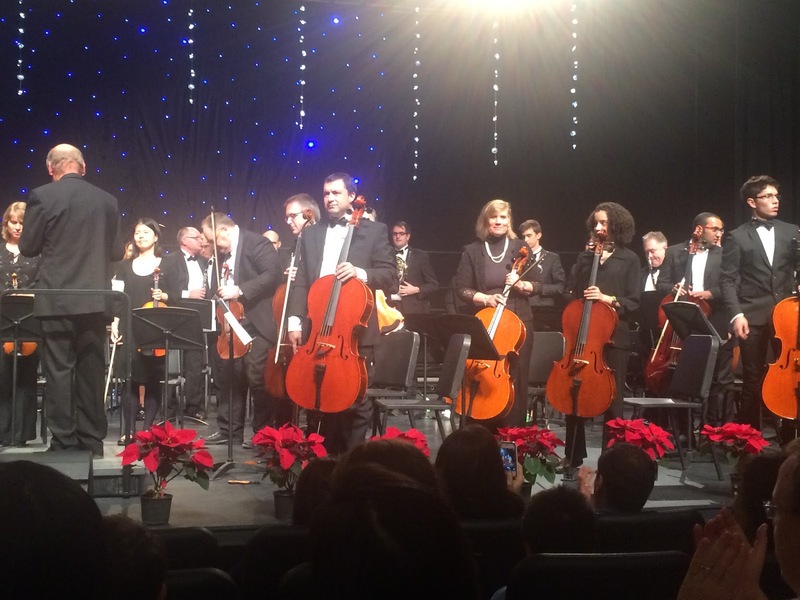 I have been stand partners in my orchestra with cellists from Australia, Yemen, the UK, Columbia, and France. The Australian cellist said to me in the beginning of the year, "There's room for everyone on the bus here." The UK cellist commented, "We have such a good mix here, don't we? (coming from people who have played their entire lives, and even one of them being a professional). I appreciate their patience in me, and their willingness for me to sit on the bus next to them. It makes me want to do the same when I am on other buses with people who are beginning something that I may know more about. As Louisa May Alcott's mother once said, "Encouragement is the greatest teacher." My Yemen cellist friend came to my house to help me get ready for an orchestra concert. I will never forget him marching around my kitchen while I played, clapping his hands to the complicated rhythm. His English was minimal, and we would talk to each other with his I-Phone dictionary, as he looked up the words in Arabic. We somehow understood each other with the music that we loved and a few common words we knew. If anyone would have seen those teaching moments in my kitchen, they would have roared with laughter. Most of the time last year my stand partner was a 14 year old ninth grader from France. I did not know when I said good by to her at the last concert in May that she would not be back this year. Her family decided to move back to France in the summer. I miss her. More than anybody, in her quiet, gentle way, she taught me how to play in an orchestra. She would point her bow to the musical symbols, smile at me, nod, and we would whisper a little together. We were unlikely stand partners--probably that you would not see anywhere else in the world. Yet our "stand partnership" worked. Playing the cello, I tell people, has allowed me to see some staggeringly beautiful scenery and gone to places I never thought I would visit. But without the fellow passengers who have taught me so much, the journey would not be so grand. 1) When you play in an orchestra, everyone, no matter what instrument you play, all tune on the A to begin the orchestra practice each week. Every week as we tune together, I always think that with all our different instruments, nationalities (I would say there are 15-20 in my orchestra), opinions, persuasions, we all begin united--on the same note. This simple tradition or regimen in the orchestra always reminds me that with all our differences as peoples or in even a family, we can find the same note to begin our dialogues. We can even stay on tune as we navigate through our music or in our relationships. 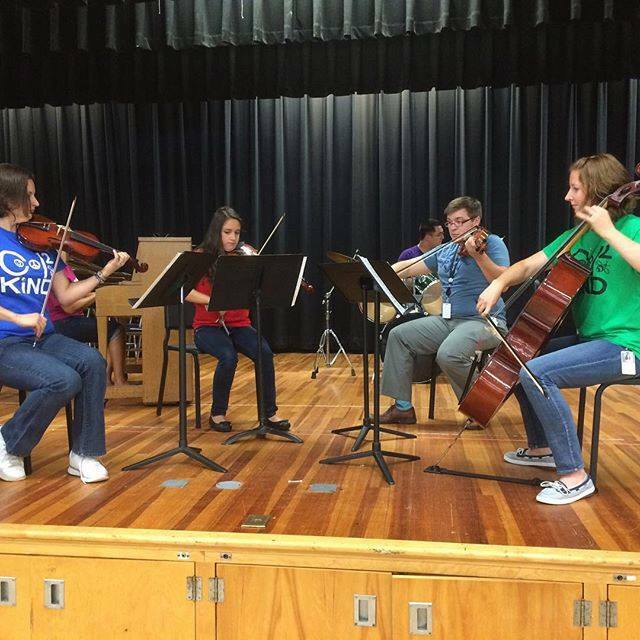 2) Everyone has a chance to shine in an orchestra--not only the violins. Sometimes the harmony comes from the violas, cellos, flutes, clarinets, oboes. In Gustav Holst's symphony, The Planets, a euphonium has a solo. We take turns playing the harmony; in one song the harmony can rotate and switch around to various instruments. We are a group that enlivens the other, and applaud when others have solos or the harmony. We strive for a beautiful counterpoint or polyphony together--the interplay between various harmonies and rhythms. 3) Sometimes I have to quickly retune--checking and adjusting the strings. I do not want to be discordant, thus, affecting other's melodiousness. I know that my dissonance can affect the rest of the orchestra. Just as in life, my mood affects the rest of my family or group I work or reside with. Sometimes I need to pause, check, and get back into tune. 4) Sometimes I play the wrong note, but as my Russian teacher says, "Just keep up with the rhythm, and don't worry about a fumbled note." If I make a mistake, in an orchestra piece or in life, I just get back into the pace or rhythm. 5) One night our British orchestra conductor, after our feeble attempt to play Dvorak's 'A New World, said, "That sounded very impressionistic." I thought that was a very kind way to say that we were not playing balanced and together. In other words, the notes were blurred, not exact; our playing of that rendition stunk. To find ways to instruct and teach with humor, and not with the sting of criticism, is always the better route. 6) It is so exhilarating, liberating, refreshing, to learn new things--especially things you never planned on but just came your way. You know enough!!!! Far across the world--nine time zones from St Louis Cardinal Nation, I am in mourning. The St. Louis Cardinals just lost in the post season for the National League Championship to the Chicago Cubs. Yes, even as an expat, living among mosques and emerging World Cup 2022 stadiums here in Doha, Qatar, I am rooting for our team. We are a faithful little enclave of Cardinal Nation over here--never to forget our allegiances. My dear friend, once an expat herself in Malaysia for 13 years who grew up in St. Louis, told me of days getting up at 4:00 am to watch games too. To be a baseball fan is a serious past time. As George Will said, "It is said that baseball is only a game. And the Grand Canyon is only a big hole in Arizona...." I guess I got my baseball fever from my grandpa who always had his small radio to his ear--to hear his beloved Yankees. Baseball, especially in the autumn, is as important as Halloween or the brilliant, vibrant changes of the season in St. Louis. School almost, and I say almost, closes down, if the Cardinals inch to the World Series. No one thinks much about anything else--work, school, deadlines. If a game is going on, the roads and emergency rooms are mostly empty. Euphoria, celebration, and the deepest of happiness spreads all over Cardinal Nation. Everyone's fears, angst, sadnesses blow away for a few weeks in October when the team is playing its post season games. Baseball is a unifier of all peoples, at least for a few weeks in St. Louis in the post season of baseball. We become kids again--together at a stadium or in front of a screen. 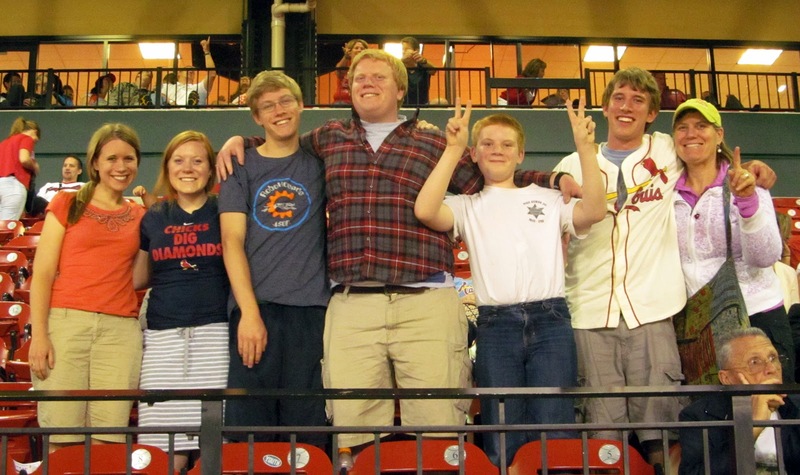 Cheering our team in Busch stadium in St. Louis! I have been told that the Cardinal or Redbird nation actually bleeds into ten states, and was Colorado's team of choice until the Rockies appeared in 1993. But I must reiterate: Cardinal fans do not die if we move across the world. 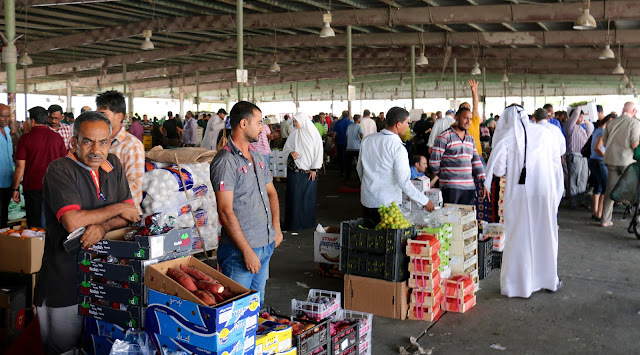 We are still devotees of the highest order, and wear our Cardinals apparel in pride around the markets in Doha. Since we travel a lot as expats, we have found St. Louis Cardinal fans in Paris and Amman, Jordan. You see, we are hearty, resolute fans--always keeping the faith that another win is around the corner--another time to celebrate and unify together. We believe in the mantra, "There is always next year." Baseball interweaves the past and the present in our lives, and all the "mystical, miraculous moments,"says author John Sexton. I agree. When David Freese hit the unexpected home run in Game #6 of the 2011 World Series, well, those are moments you cannot forget. They are etched in our hearts. https://www.google.com/webhp?sourceid=chrome-instant&ion=1&espv=2&ie=UTF-8#q=david+freese+world+series+homerun I don't think St. Louis and Cardinal Nation slept much that night. Only one other team, the Mets '86, came out of the one strike away abyss to win the World Series (I was living in New York City at the time when cars were being turned over in Manhattan, and the whole city was triumphant for a season). As St Louis Cardinal Skip Schumaker said in 2011, "It must have been destiny."" Baseball reminds us there is always hope, always comebacks, always a chance for redemption. On a Teton river trip with some of my boys--all sporting their Redbird hats. Indeed, we fans stick together, starting in the spring, to feel that camaraderie, community, and unity on a green field. 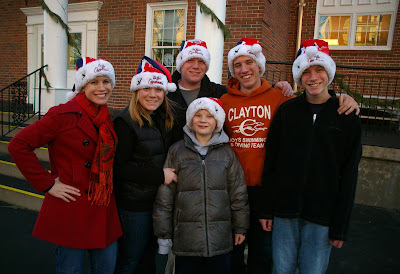 To share those marked moments with loved ones, with all the history and tradition, is worth all the hoopla. Dancing around with my husband and teenage boys in our living room when David Freeze hit his famous home run are lore of Shumway family history. Need I tell you that I was roused out of bed that night because I had given up hope on the Cardinals? I saw the famous home run, but almost missed it. Never again. Baseball, the game without a clock, is a game about never relinquishing hope. That is the reason why we keep coming back for next year--to be a part of a Nation, a community that shares miracles together. But in the meantime, as we are supposed to be happy for others, and I will give a shout out for Chicago who won their against the Cardinals on their turf at Wrigley Field. But again, just you wait until next year.... My hope will never run dry. 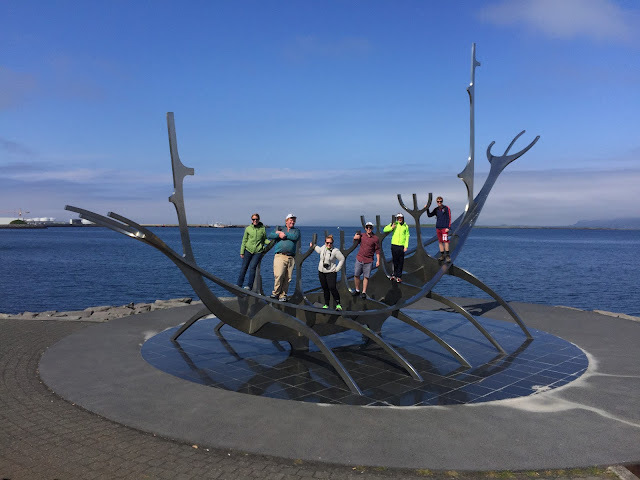 A famous sculpture in the Reykjavik harbor of a fishing ship, one of the iconic symbols of Iceland. 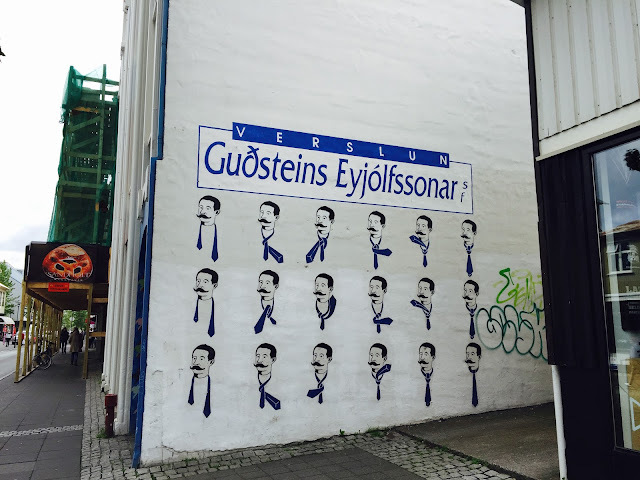 In our recent trip to Iceland, I was immensely struck by the inner creativity of most everyone I met. 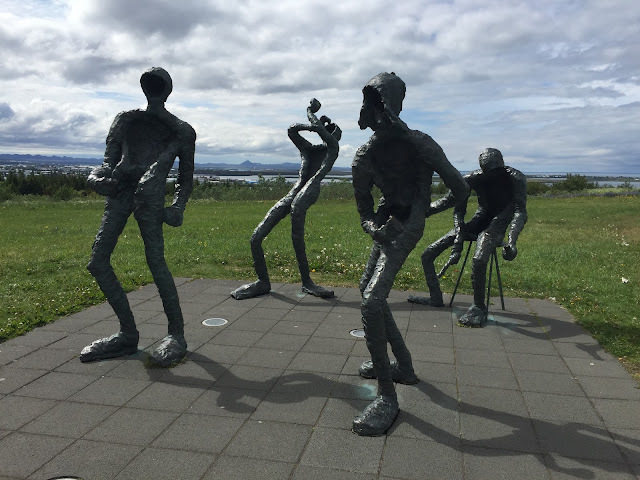 Is it because Icelanders experience almost full time light for the summer months--absorbing much luminosity--and then industriously work all winter long in the shadows to unleash that creativity? Does the stark, enchanting scenery that the singer Bjork calls "emotional landscapes" evoke new ideas to explore? Is there an elixir in the Land of Fire and Ice to see the world in a different way, and then to execute that creative idea? Is is because the weather can be harsh and relentless, and people already know they can be resilient and take risks? 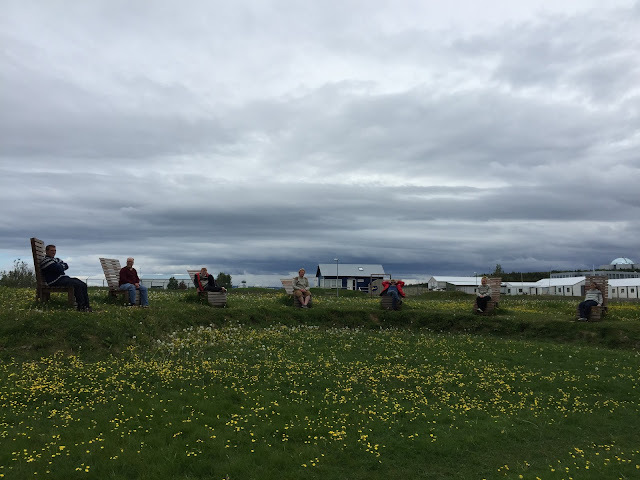 Perhaps the ubiquitous trolls or fairies in Iceland bequeath the creativity? Whatever the answer, there is undoubtedly an unmistakable creativity that is fueled here. As my Icelandic cousin said, "Everyone here is a designer, a carver, a knitter, a poet, a photographer." I am half Icelandic, and I have heard my entire life the merits of being Icelandic from my father (my siblings and I wholeheartedly believed every word). On his first visit when he was in his early 40's (his grandparents were immigrants to Canada), he too came away with the same sentiments that I had about Icelandic creativity. I remember his astonishment when he eagerly came home to tell us his observations, "As I talked to anybody, a fisherman or truck driver, everyone could tell me the sagas. They were the best of storytellers." He excitedly continued, "All were wordsmiths, and some even told their own poetry. People designed and carved furniture. Every house I entered had paintings their family members had painted of the Icelandic landscapes. 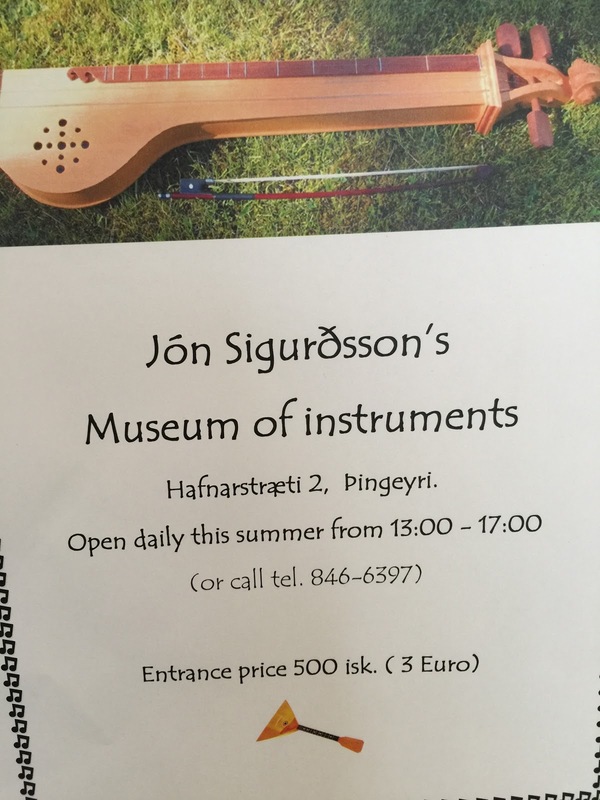 It is the most wonderful place, and you are Icelandic!" 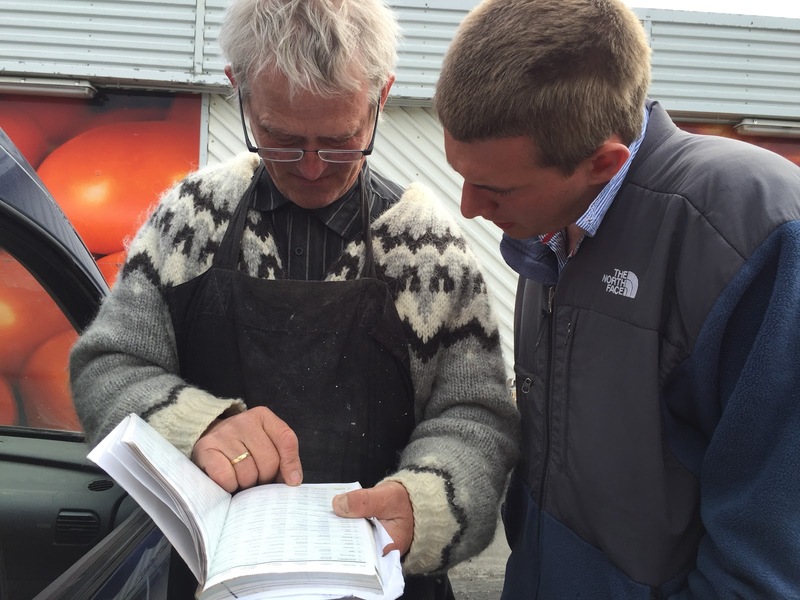 We, his children, swallowed his Icelandic tales--hook, line, and sinker. His praise was effusive, (but I later learned was not exaggerated) and I too wanted to visit the Motherland, the place of staggering beauty and imaginative people. Whatever you want to believe, there is undoubtedly a culture of Icelandic creativity--not to be dismissed or ignored. With a 2013 population of slightly over 323,000, the creativity, at least to me, is explosive. There are hundreds of museums, even a town of 250 people will have a few. Public art and sculptures are beautifully positioned in almost every small town--evoking a strong sense of identity and charm. There are craft associations in almost every hamlet where you can buy local art, sweaters, and other crafts. Yet, as always, it was the people who captivated me--their deep reservoir of imagination and vision to make the world a more wondrous, beautiful place. 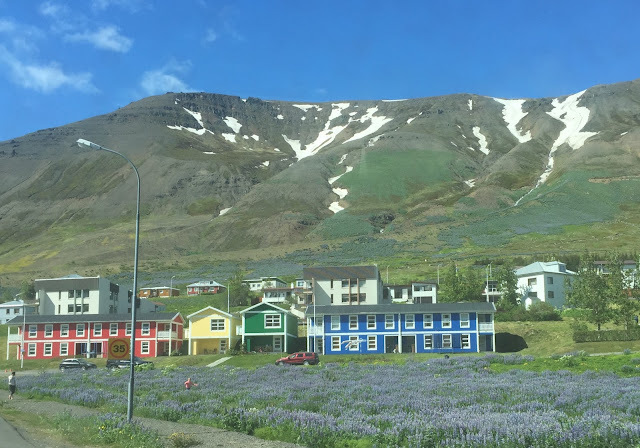 One writer, Eric Weiner, explains the prolific level of creativity in Iceland, "There's no one on the island telling them they're not good enough; they just go ahead and sing and paint and write." Perhaps there is a shade of truth in this statement, but I prefer to think that creativity is unusually valued in Iceland. They recognize that to only view the staggeringly magnificent scenery is not enough: they need to be producers and creators of what is stirring inside of them. There is an infectious, creative spirit that seems to be transmitted in Iceland-- to not only have lofty thoughts or intentions, but to give birth to them. It is an enlivening, stimulating, beautiful place to be. Iceland makes you remember there is an endless array of possibilities to be a creator within yourself, and it resides in everyone else around you. Boundaries and barriers diminish in the Land of Fire and Ice, and every creation seems attainable. The Danish cook/owner of the Pingeyri cafe makes dangerously delicious waffles for breakfast and a hearty lamb stew for dinner. She and her Belgian husband saw a need for a cafe in a tiny town, and renovated an old post office. 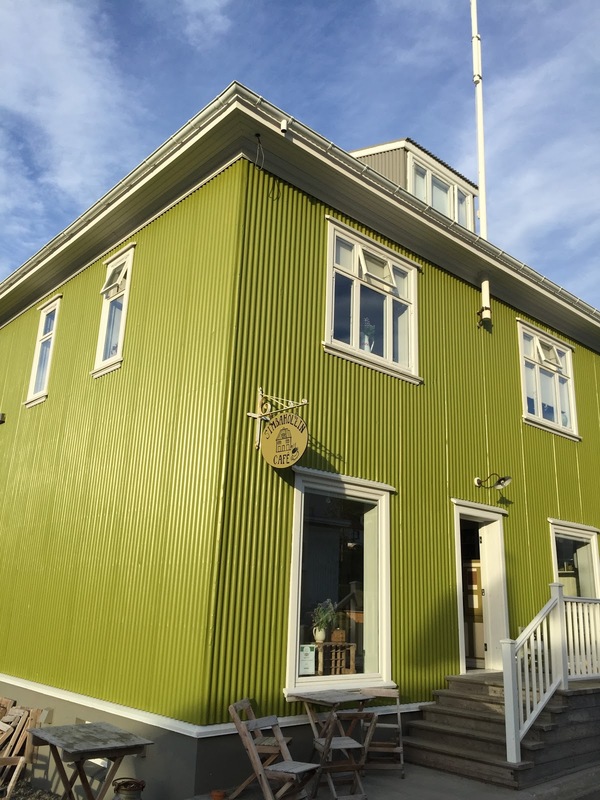 The moss green painted building is gorgeous, and people come from hours away for the food in the Westfjords. In the small fishing village of Pingeyri, this is the Simbahollon Cafe that serves people all day long. I don't remember any other restaurant in town. 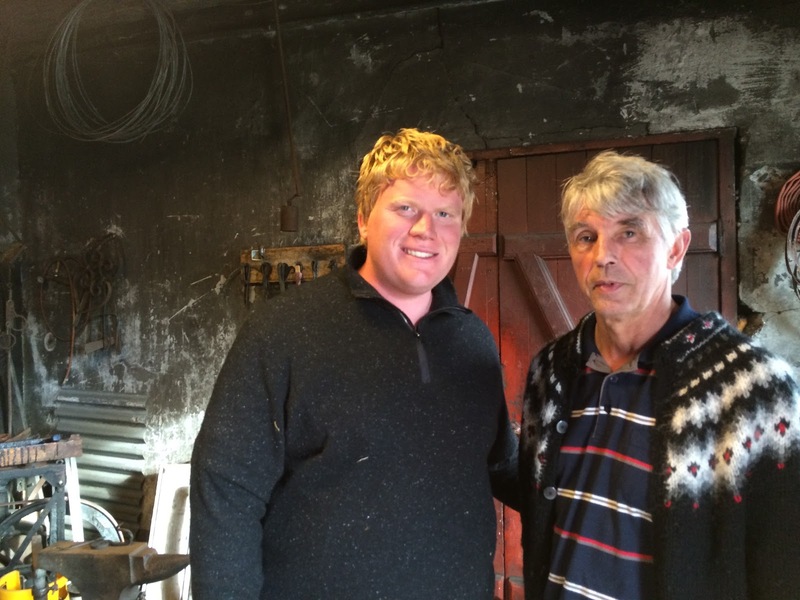 My son, with the area's historian and owner of the blacksmithing museum---showing old historical tools. 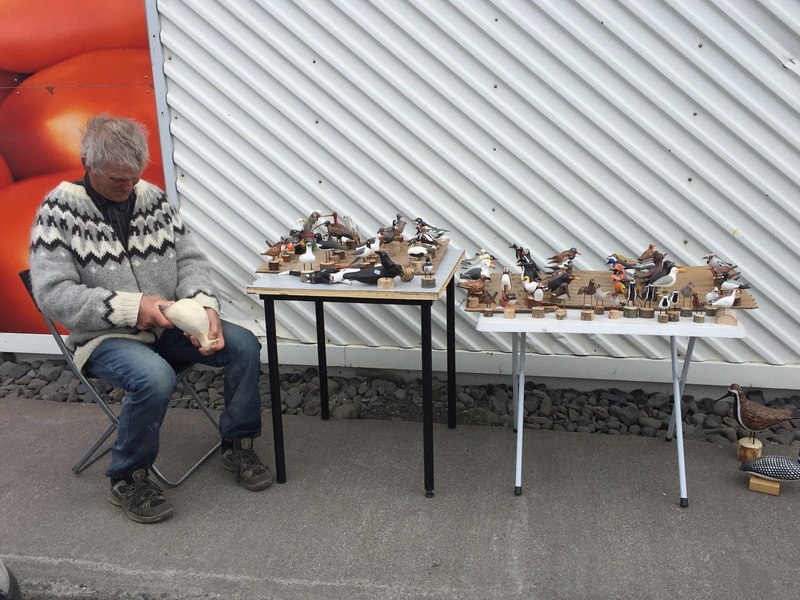 At a small village in the middle Western Fjords, a man carves birds in front of a grocery store. This man, in his retirement, carves the many birds of Iceland. He is showing my son his book on birds. His love for birds and carving was infectious to me. He told me he goes to schools and recreation centers to teach young children how to carve birds too. Public art turned utilitarian, in a gorgeous meadow overlooking the harbor in Reykjavik. A friend and her husband brought a design class from Qatar to Reykjavik to view the new design trends in Iceland. Reykjavik, the world's most northern capitol, is becoming more influential in fashion and design. A friend admiring some parent/child clogs. 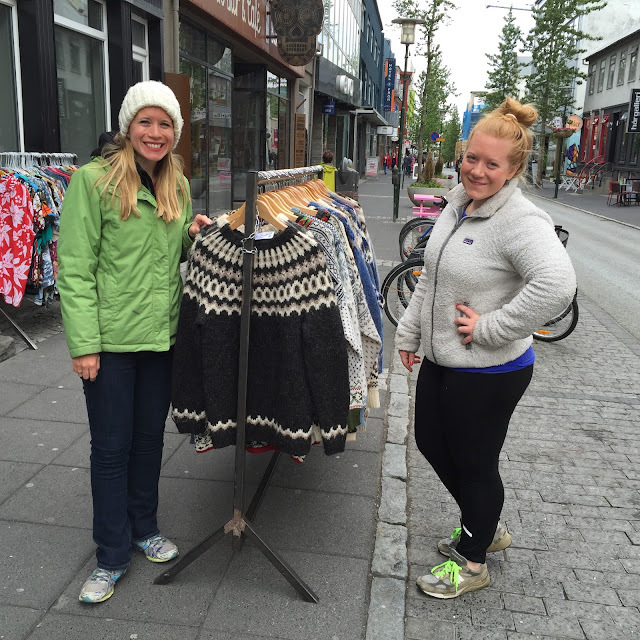 One of the best things about Iceland--their traditional sweaters. My daughters outside a second hand vintage clothing store, called Sprintnik. They do a brisk business with tourists who don't want to pay full price for new sweaters. Each of us (all eight of us) got a sweater here. 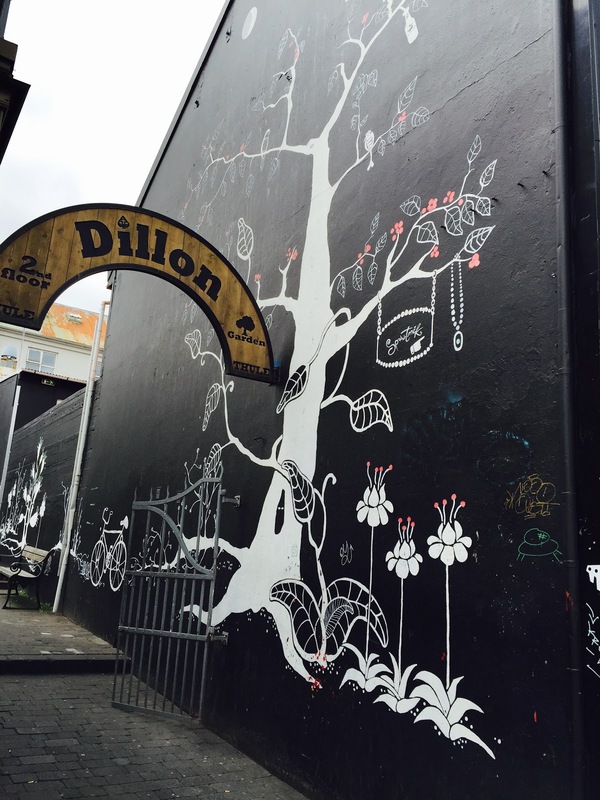 Many of the buildings have lovely, interesting paintings on the outside walls. I thought that this was a very creative decoration on a entry gate. 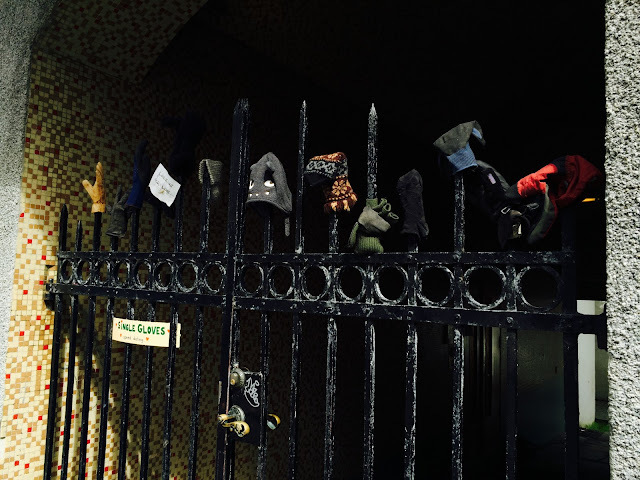 People who had found hats and gloves could put it in this place for anybody who was looking for one. 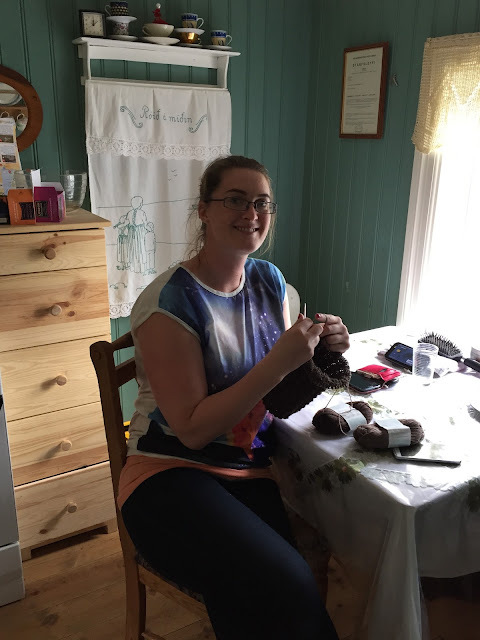 A young woman at a small cafe in the Westfjords who is knitting her daughter a hat. One of the best things about going to the grocery store was seeing an entire aisle devoted to the most exquisite yarns. Most everyone knits, and it is a past time when anyone has a spare moment. There are knitting guilds in many towns. Women take great pride in their knitting projects. Family members proudly wear the sweaters and other winter gear that they loved ones make for them. We loved the varying colors of the houses--often times with different colors of roofs. It made for a mesmerizing sight if you were high up looking over the town. An innovative outside business, with picnic tables outside. 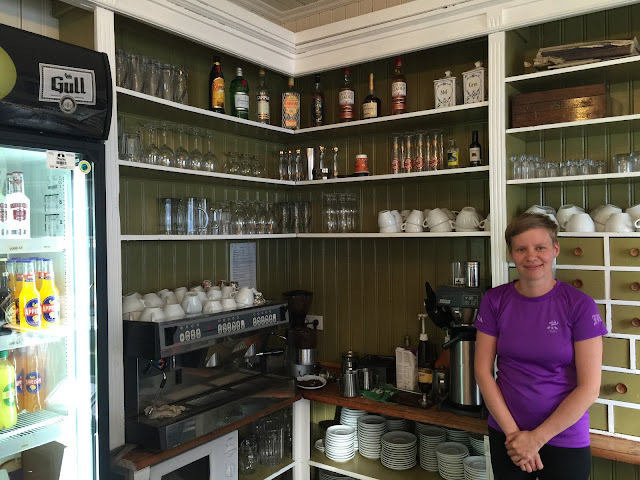 This woman had just opened her little restaurant near the harbor in Hosfos, in the northern part of Iceland. She sold stinky shark and traditional marriage cake. 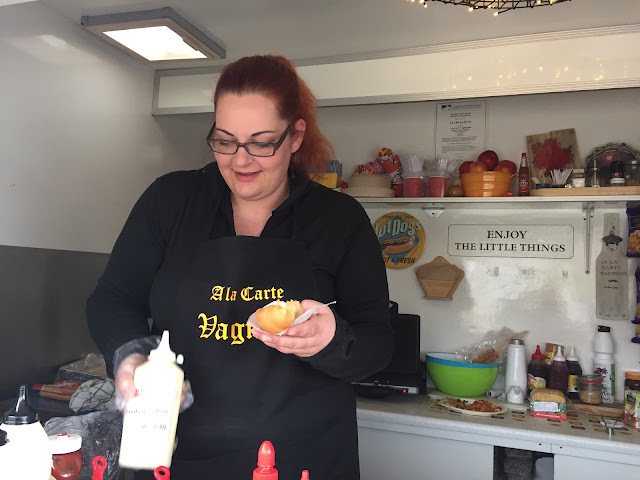 Her lamb and vegetarian hotdogs were famous for miles around. 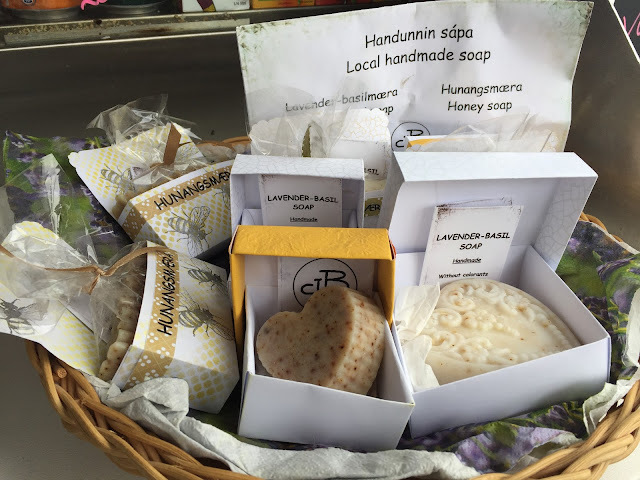 She is selling some handcrafts at her restaurant booth of handmade soap. 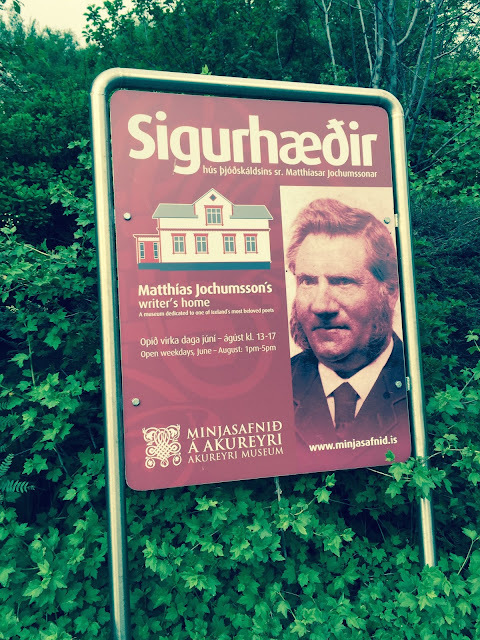 Matthias Jochumsson is a distant relative of mine. He wrote the national anthem for Iceland, and was a famous translator, playwright, and poet. We went to his home in Akureyi, Iceland. One of my children is named after him. If you want to read more about him: http://www.minjasafnid.is/?m=page&f=viewPage&id=109 Literacy and the power of the word are one of Iceland's greatest historical treasures. 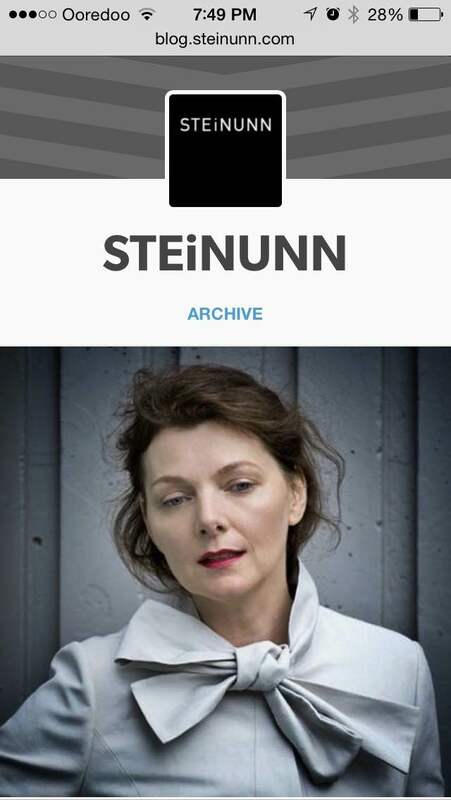 To write a poem is a sublime feat to any Icelander. If you can tell a good story or even better yet, you can write one, you are rich indeed.